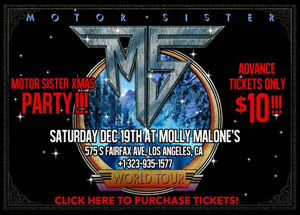 Los Angeles hard rock outfit MOTOR SISTER has announced a special hometown performance on December 19th! Set to take place at Molly Malone's, fans are welcome to join the band for a pre-Christmas rock 'n roll bash starting at 9PM. For more event and purchase details, please go HERE. MOTOR SISTER released their debut full-length, Ride, earlier this year to critical acclaim. Comprised of a group of musicians whose collective musical pedigrees speak for themselves (MOTHER SUPERIOR's Jim Wilson, ANTHRAX's Scott Ian, Pearl Aday, FATES WARNING/ARMORED SAINT's Joey Vera and WHITE ZOMBIE/TESTAMENT's John Tempesta), the quintet was originally assembled to jam for Scott Ian's 50th birthday party. Thanks to Scott's wife Pearl Aday, who has been working on her solo career with Jim Wilson for years, all it took was a quick phone call and the stage was literally set for Scott's dream gig. "I wanted to cherry-pick a set list of my favorite MOTHER SUPERIOR songs and get these guys together and have the concert at my house," Scott says of the event that eventually led to an album. Since their formation and the release of Ride, MOTOR SISTER has performed at the prestigious MOTORHEAD Motorboat Cruise, in addition to other dates across the USA. The band's upcoming Christmas party at Molly Malone's will be a rare, intimate show that fans won't want to miss! For a glimpse of MOTOR SISTER's riveting rock n' roll show, a new live clip from the MOTORHEAD Motorboat cruise has been posted online (with more footage coming soon!) HERE.